GREENVILLE COUNTY, SC (WYFF) - Video released by the Greenville County School District shows the moment a tractor-trailer crossed the center line and hit a school bus carrying special needs students. The collision happened just after 3 p.m. Tuesday on Fairview Road between Wilson Bridge Road and Rivers Edge Circle. The tractor-trailer was driving north on Fairview Road when it ran off the right side of the road, hit a power pole, continued driving and crossed the center line, striking the school bus as it traveled, South Carolina Highway Patrol troopers said. 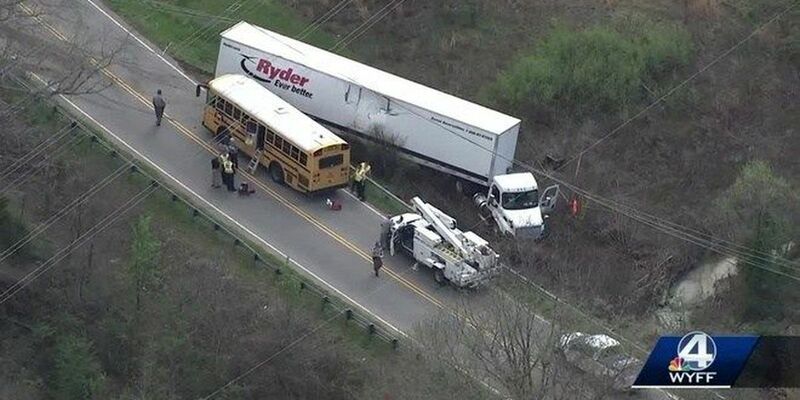 There were four special needs students from Sara Collins Elementary School and Washington Center on board, along with the driver and an aide, according to the Greenville County Schools Transportation Department. Officials said no one on the bus had serious injuries. After the crash the driver, Tammy Cummings, calls authorities to report the crash. Cummings then tells the children they need to stay on the bus due to the downed power line. She assures the children they are OK and tries to divert their attention by asking them what kind of games they have on their phones. Cummings is a school bus safety trainer for Greenville County Schools, according to Adam James, director of Transportation, Greenville County School District. "She actually did write our special needs training textbook. We do scenario-based training. We do skits. We try to leverage everything to train these (drivers)," James said. Gary Mccan, 24, the driver of the tractor-trailer, was charged with driving left of center, troopers said. Mccan was injured and taken to the hospital by emergency medical services, troopers said.